It's no secret that GOP front-runner Donald Trump has quite a few detractors. One anonymous person took their ire to a wholly unacceptable level when they reportedly sent a suspicious package containing a white substance to his son as well as a letter threatening the Donald's children on Thursday. Eric Trump is being targeted as the recipient of that package, though both he and Donald Trump, Jr. have been campaigning heavily for their father. Likewise, Ivanka has made a few appearances and lobbied for her father as well. Eric's presence throughout the Trump campaign unfortunately made him the primary recipient of this anonymous attack, however. The package reportedly came postmarked from the Boston area and was received on Thursday at Eric's New York City apartment. Eric's wife, Lara, opened it and allegedly found white powder inside, with the mystery substance reportedly poured out of the envelope. Authorities were called to Trump Parc East at around 7 p.m. that night to investigate what the malicious package sent to the Trumps contained. The contents of the package are still being investigated, though a handwritten threat insinuated that the powder was innocuous. According to CBS News, the message inside reportedly stated that, were Donald Trump to continue his campaign, "harm will come to the kids." The Trump campaign has been very visible, has been described by a number of people as being divisive, and just as we have seen strong actions by his supporters, law enforcement would expect strong reactions from his detractors. Unfortunately, in the time we're living in, that could also mean the potential for acts of violence against the candidate and those associated with the candidate. 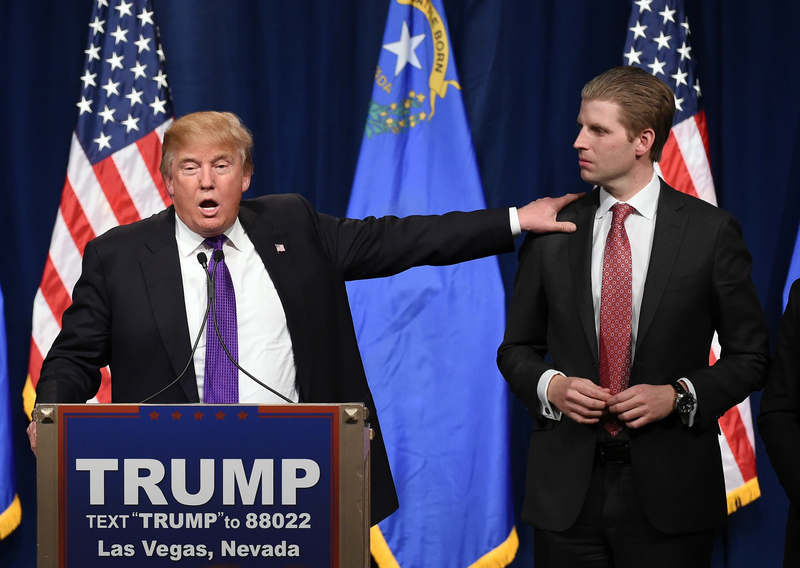 Eric Trump certainly wasn't a household name prior to his father announcing his candidacy. The youngest son of the Donald and Ivana has been a consistently supportive presence and repeatedly gone on the record to defend his father. In an interview with CBSN just two weeks prior, Eric had praised his father's campaign for finally inspiring American citizens to get involved in politics. He has been similarly visible throughout the campaign and has even sat in the audience at GOP debates to cheer on his father. As a precaution, another Trump property in New York City — Trump Tower on Fifth Ave — was surveyed by law enforcement. NYPD, the Secret Service, and the Postal Inspector are all working under the FBI Joint Terrorism Task Force in an attempt to piece together who was behind this attack as well as prevent similar instances from occurring, no matter what decision the Donald makes about his campaign.